Professional office space available for training sessions. Modern facilities with WiFi access included plus coffee machine. Powerpoint presentations can be facilitated through the Apple TV. Black vision board plus a flip chart are available. 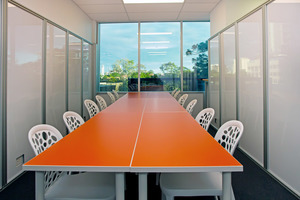 Room can be configured as required - suggest a maximum of 12 attendees. Secure basement parking is available in the Southport Central Carpark - first 3 hours free or $5 all day car parking close by. Easily accessible via bus and GLink. Great location in the hub of Southport with cafes, restaurants, Library and shops within easy walking distance. Available 7am to 10pm - 7 days .